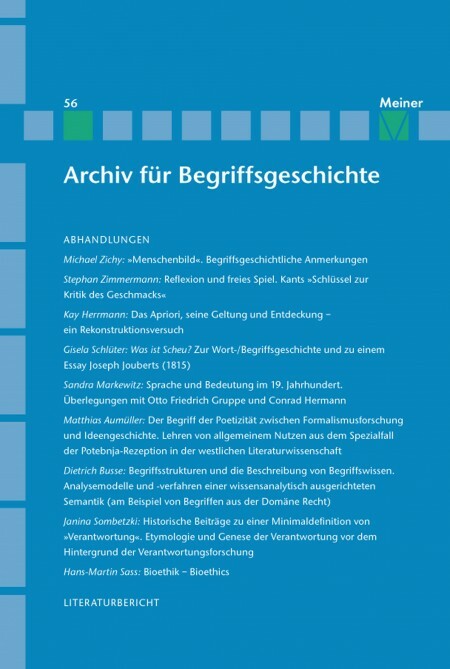 Archiv für Begriffsgeschichte 56. 2015. Begründet von Erich Rothacker. Redaktion: Annika Hand. 260 Seiten. The German term ›Menschenbild‹, which, in its modern sense, might be translated as (public) understanding of human nature, is very popular both in public and in academic discourse. There is widespread consensus that ›Menschenbilder‹ are fundamental to human selfunderstanding and the organisation of society. This paper examines the history of this concept and follows the multiple changes of its meaning that have occurred between the middle ages and today. As the »key to the critique of taste« in §9 of his Critique of Judgement Kant offers the well-known doctrine of a »free play of the cognitive faculties«. What exactly this play consists in is still much discussed in the literature. Kant describes it as a state of harmony between imagination and understanding, for which the reflecting judgement, which mediates between the two, is responsible. This paper turns against the popular interpretation that considers »free play« as an exceptional state of the mind in which the said faculties are relieved from their actual cognitive activity. This view, however, creates a number of inconsistencies. Above all, Kant explicitly speaks against it. The paper therefore argues for an alternative reading that is able to take these objections into account. The problem of synthetic judgments touches upon the question whether philosophy is in fact capable of making independent truth statements. According to Kant, synthetic judgments formulate the conditions for the possibility of objectively valid knowledge a priori. As far as empirical attempts at reinterpretation of the aprioristic fall short of this ambition, Kant’s a priori goes deeper. This is because modern science strives towards objective knowledge, although its statements are fundamentally fallible. The topic of synthetic a priori thus continues to be relevant. This paper will show that, in order to be viable at all, a modernized version of transcendental philosophy must ›depart from‹ the concepts of »independence from empirics« and/or the »purity« of the aprioristic. Kant’s reflections on nonpure synthetic a priori knowledge already contain attempts at this. Furthermore, the aprioristic validity of knowledge does not exclude the possibility, that it can be discovered empirically. Fries and, subsequently, Nelson proceeded with this separation (initially ascribed to Reichenbach) between the contexts of validity and discovery of knowledge, pointing out that the a priori can indeed be discovered empirically, yet never be proven. Currently, there are still a number of valid reasons for arguing that concepts from transcendental philosophy (space, time, substance, causality, freedom and the distinction between the noumenal and phenomenal worlds) continue to be of fundamental importance for the modern sciences. However, it must not be neglected that, even within a modernized framework of transcendental philosophy various unsolved problems remain and/or are created (such as the unfeasibility of the aprioristic claim to general validity and necessity, the problem of drawing a clear boundary between the noumenal and phenomenal worlds). Moreover, the »beautiful structure« of the Kantian system, which constitutes much of its persuasive strength, is lost. ›Shame‹/›Scham‹ has recently been dealt with in diverse contexts. This paper focuses on ›shyness‹/›Scheu‹=›Schamhaftigkeit‹/›pudeur‹ corresponding to ›aidos‹ and ›verecundia‹, retracing the history of the concept in German, French, Italian, and English language. ›Scheu‹/›shyness‹ implies aloofness, extreme sensitivities, physical reactions of bashfulness in men as well as in animals. The concept becomes quite widespread in the course of the 18th century, taking on sensualistic connotations. Rousseau presents himself as a victim and at the same time as a hero of ›pudeur‹/›crainte‹/›timidité‹. ›Scheu‹ becomes a characteristic attitude of the ›schöne Seele‹/›the beautiful soul‹ dear to German classicism and idealism but criticized by Hegel. In his outstanding essay Qu’est-ce que la pudeur? (1815) analyzed in this paper, the French philosopher Joseph Joubert argues for an ideal keeping apart from the world. Both Otto Friedrich Gruppe and Conrad Hermann precede contributions by Carnap, Wittgenstein, and others to modern philosophy of language. Unexpectedly, the notions of language and meaning were introduced in the 19th century: in the Vormärz context, seemingly solely ›modern‹ understandings of the relation between language and thought, are formulated convincingly; the rediscovery of this hidden ancestors of the linguistic turn sheds light on the understanding of central philosophical notions and the notion of modernity itself. The philologist Aleksandr Potebnya (1835-1891) coined the Russian term of poeticalness, i.e. literariness. His ideas were adopted and modified by the Russian Formalists who gave modern literary criticism its linguistic shape. The relation between Potebnya and the Formalists is not quite clear, however. Do they owe him more than they admitted? Or did they change his ideas so significantly that he cannot truly be considered their ancestor? In this paper, I give an outline of the Western reception of Potebnya’s literary theory, dividing it into three historical sections. The first section of the reception shows Potebnya’s literary theory exclusively in the light of Russian Formalism. The second section concentrates on Potebnya’s own ancestors. And the third section tries to give a thorough account with regard to the European history of ideas. In recent cognitive science as well as in linguistic semantics meanings of words, phrases, or texts are conceived as concepts or systems of concepts. In cognitivist approaches and advanced approaches of linguistic semantics concepts are conceived as cognitive structures (or, more precisely, epistemic structures or structures of – meaning-relevant – knowledge). For these structures the model of »frames« has been simultaneously invented by cognitivists (like Marvin Minsky) and linguists (like Charles J. Fillmore). On this background the paper discusses some aspects of a linguistically sufficient theory of concepts and concept-analysis, argues for a certain kind of frame-analysis, and demonstrates the advantages as well as some shortcomings of a frame-semantic analysis of epistemically complex concepts exemplified by legal concepts from German statutory law. The considerations in this paper are seen as part of the general aim of what is called by the author an »epistemically oriented semantics«, i.e. a semantics and/or analysis of concepts that (contrary to mainstream-approaches of semantics and concepts in linguistics, logic, and philosophy) accounts for the understandingrelevant knowledge in its entirety. No consistent and universal definition of responsibility has been provided so far – neither in the general scientific context, nor (surprisingly) in studies and research explicitly related to the responsibility phenomenon. In this paper I outline a minimalistic definition of responsibility exploring to what extent the ›preresponsible concepts‹ duty and guilt merge in our contemporary understanding of responsibility. Epistemologically the minimalistic definition of responsibility combines three ideas: to be responsible is (1) a normative concept, it means (2) to be answerable for something, and is based (3) on the assumption of a certain psycho-motivational constitution of the responsible agent. The term ›Bioethik‹ was first used by Fritz Jahr 1926 in introducing the ›Bioethical Imperative: Respect every living being in general as an end in itself and treat it, if possible, as such!‹. The term was ›reinvented‹ 1970 by Van Rensselaer Potter in an article ›Bioethics: The Science of Survival‹ calling for knowledge of how to use knowledge’, then again 1971 at Georgetown University in Washington, DC, when the ›Kennedy Institute of Bioethics‹; a rare ›three-located birth‹ of a term. The Kennedy Institute’s focus on medical ethics led to a quasi synonymous use of ›bioethics‹ and ›medical ethics‹. Recent conceptual and terminological developments suggest to use ›bioethics‹ as a comprehensive term, which includes social, cultural, environmental, medical and other fields of applied ethics.